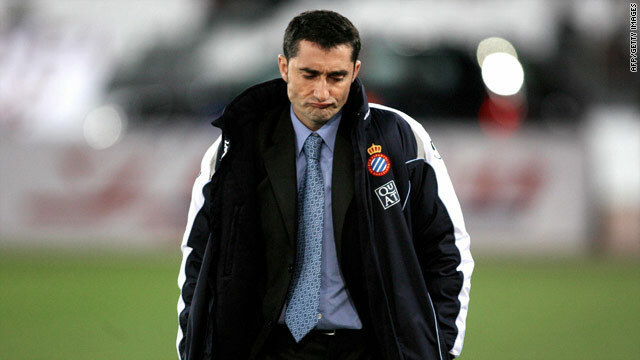 Ernesto Valverde becomes the sixth coach to lose his job in the Spanish Primera Ligia this season. (CNN) -- Villarreal have sacked coach Ernesto Valverde following Sunday's 2-0 Spanish Primera Liga defeat at home to Osasuna. Valverde only took over at Villarreal in the summer following Manuel Pellegrini's departure to Real Madrid. However, the Yellow Submarines, who finished fifth last year, have had a disappointing season and are 10th in the table following Sunday's loss. "Villarreal have cancelled their contract with coach Ernesto Valverde after the defeat against Osasuna," the club confirmed in a statement on their official Web site. "The club thank the coach for his services and wish him the best of luck in his sporting career." Villarreal, who have been linked with former Getafe coach Michael Laudrup, have said they will name Valverde's replacement in the next few days. The club thank the coach for his services and wish him the best of luck in his sporting career. Despite a recent draw against Barcelona at the Nou Camp, Valverde has paid the price for an inconsistent season which has also seen the club crash out of the Spanish Cup to second division side Celta Vigo. The 45-year-old becomes the sixth coach to lose his job in the Spanish top flight this season following the departures of Abel Resino (Atletico Madrid), Juan Carlos Mandia (Racing Santander), Marcelino Garcia Toral (Real Zaragoza), and Hugo Sanchez and Jose Angel Ziganda (both Xerez). Meanwhile, on the pitch, Sevilla moved up to fourth place in the table as a double from Alvaro Negredo -- the second a superb chip -- earned them a 2-1 home victory over third-placed Valencia. David Navarro headed a late consolation for Valencia but they were unable to prevent Sevilla moving to withing three points of them. In earlier matches, European-chasing Getafe were held to a 0-0 by a Racing Santander side who played almost the entire second half with 10 men after Jose Moratan was dismissed for two bookings. And Atletico Madrid were jeered off by their own fans after slumping 2-0 at home to Malaga, their ninth defeat of the season.